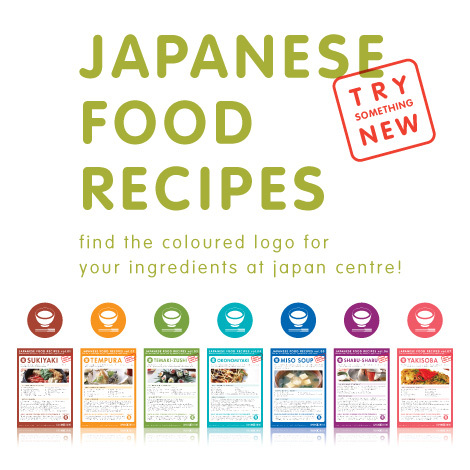 To complement the start of our new initiative to help people cook Japanese food at home, Japan Centre has introduced a selection of recipe flyers directly in our shop to guide you on your way to creating delicious, authentic Japanese meals at home easily. Each recipe is uniquely colour-coded to help you find the right ingredients at our Japan Centre shop. All you have to do is choose the recipe that you want to create and then find the coloured logo next to the ingredients that will be required. What recipes are currently available? A hotpot style meal of thinly sliced meat and vegetables cooked in a sweet soy flavoured soup. Tempura is a popular dish of different meats, seafood and vegetable deep fried in a light and crispy batter. One of the easiest and most fun to make varieties of sushi, made by rolling up rice and different ingredients in a sheet of nori seaweed. Okonomiyaki literally means “Griled as you like it”. A delicious savoury dish that can be made with many different ingredients. A staple of the Japanese diet, eaten with many meals it is healthy, delicious and easy to make. Shabu-Shabu is similar to sukiyaki, but the ingredients are cooked separately to each other and eaten with a more savoury sauce. Another popular Japanese dish often available at festivals. These noodles taste great and can be made very easily at home. Why not help us create more recipes? At Japan Centre, we highly value the feedback we get from our customers, so please let us know in the comments if there are any other Japanese food recipes you would like to see at Japan Centre or had any suggestions about our current recipes. Alternatively, you can send your comments to us via email at: recipe@japancentre.com. Other good ones will be different variations on curry or cream stew. Thank you for your comments. We are definitely checking out your opinions for some tasty new recipes. Japanese curry and some special occasion foods are now on the cards! Please continue with your comments and suggestions about our new recipes, they are very welcome! Good idea, but I’m not in london and I usually buy your grocery from your online web-site…why not putting these recipe flyer online?So that everyone could be free to view it directly from your website? Thank you for your comment Paolo. All the recipes in store and many more will be posted on the blog over the next few months! I love those new recipe flyers! I also hope that all flyers will be available online, too. This would be really cool! Hi there very cool site!! Man .. Excellent .. Wonderful .. I will bookmark your website and take the feeds also¡KI am satisfied to search out a lot of useful info right here in the post, we need develop extra techniques on this regard, thank you for sharing. . . . . .